Warranty - 1-year limited hardware warranty with return to factory replacement and a 90-day limited software warranty. Includes power supply. The Cisco SPA525G2 5-Line IP Phone with Color Display is an excellent choice for businesses that require an enhanced user experience with a hosted IP telephony service, an IP private branch exchange (PBX), or a large-scale IP Centrex deployment. Part of the Cisco Small Business Series, the SPA525G2 uses industry-leading SPA voice over IP (VoIP) technology from Cisco, with high-quality hardware providing additional connectivity via Bluetooth, PoE (802.3af), or a Wireless-G client (802.11g). 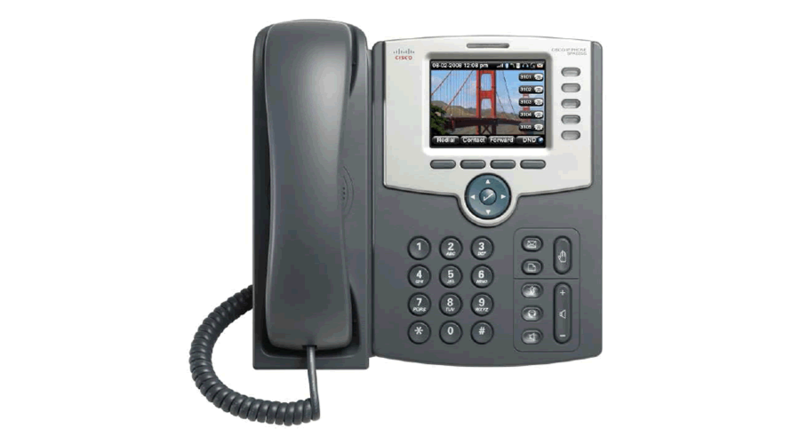 Standard Cisco SPA525G2 features include five active lines, VLAN-capable dual switched Ethernet ports, 802.3af PoE support, a 3.2-inch QVGA color display, a full-duplex, high-quality speakerphone, a Bluetooth interface, a Wireless-G (802.11g) client, a 2.5-mm stereo headset port, and a USB 2.0 host port. Each line can be configured independently to use a unique phone number (or extension) or can use a shared number that is assigned to multiple phones. The power supply for the SPA525G2 is sold separately. The optional SPA500S 32-button attendant console adds up to 64 buttons for receptionist positions.